My Attic closes this round at midnight tonight. It will be the last for the year, but back in 2016. This pant-suit is the perfect look for a party atmosphere. It is by Lavian, and has an incredible hud giving you a zillion options for mixing colours of the top and bottom and then also the belt. This colour combination had me feeling very Indian inspired, and as that was always the idea behind the dividers for the shaken set we made a while ago, I incorporated them together with the great string lights by Chic buildings. 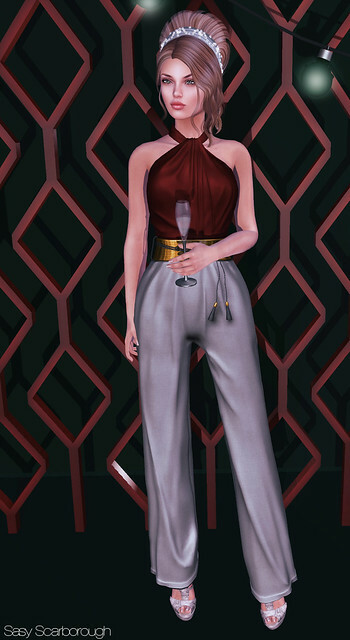 The poses and champagne glass are also part of Chic’s release at My Attic this round, and so delightful to have an entertaining set to pull out for special occasions. The hair is by Emo-tions, also at My Attic, and with the pearl embellishments on the silk scarf bringing the style together, I am ready for a great festive season.